Let’s face it: Disney Parks are going through some major changes, and Epcot is no exception. The second of four theme parks at Walt Disney World, Epcot is a fan-favorite among annual passholders and first-time visitors alike. So when Disney announced that Epcot would be undergoing some pretty major transformations over the next three years, they were met with contrasting opinions. Either way, we’re here to share all the details of every new attraction, restaurant, experience, and overall change coming to Epcot by the year 2021. Perhaps one of the biggest announcements regarding what’s to come at Epcot is a whole new entrance. Disney revealed that the park’s reimagined entrance will pay homage to Epcot’s original entrance with a fresh take on classic elements. It will welcome guests with “new pathways, sweeping green spaces, and a newly reimagined fountain.” Disney also shared that “significant redevelopment” will take place in the area between Spaceship Earth and the World Showcase Promenade, though more details have yet to be shared. Remy’s Ratatouille Adventure is one of the most anticipated new attractions coming to Epcot in the next few years. 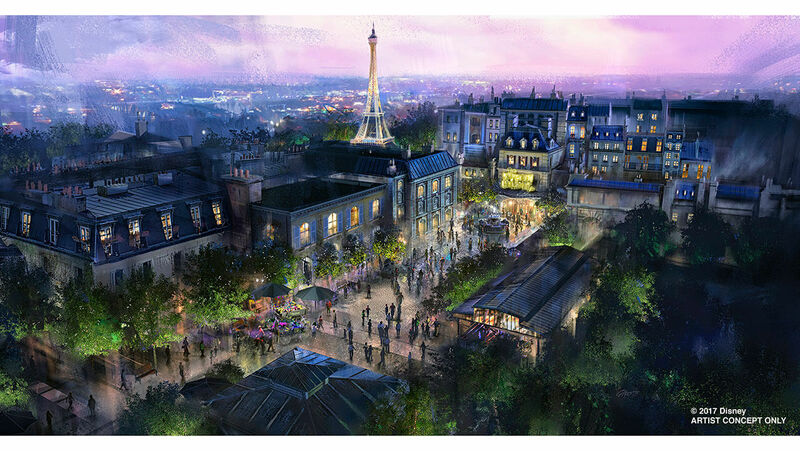 Disney announced that Remy’s Ratatouille Adventure, similar to the “Ratatouille”-themed attraction in Walt Disney Studios at Disneyland Paris, will be added to a new area behind the Eiffel Tower as part of an expansion of Epcot’s France pavilion in the World Showcase. The new attraction inspired by the hit Disney-Pixar animated film is expected to open by 2021. A “Guardians of the Galaxy”-themed indoor roller coaster is being added to Epcot’s Future World and will also make its debut in 2021. The attraction, which will be among the largest indoor roller coasters ever, is being constructed in the area formerly occupied by Universe of Energy/Ellen’s Energy Adventure. Disney has yet to formally announce the attraction’s name, but it will be the first Marvel-themed attraction on Walt Disney World property. You can take a look at the epic ride vehicles here. With Epcot’s IllumiNations: Reflections of Earth fireworks show ending in 2019, two all-new fireworks shows are coming to the theme park over the next few years. A limited-time fireworks show called Epcot Forever will debut later this year as a celebration of the classic Epcot theme park. Then in 2020, a currently-unnamed fireworks spectacular will premiere at Epcot and will feature massive floating set pieces on World Showcase Lagoon, custom-built LED panels, choreographed moving fountains, lights, pyrotechnics, and lasers. We’re excited to see the limited-time Epcot Forever show, but the 2020 fireworks spectacular seems better than the original IllumiNations, and we can’t wait. A number of new films will debut in Epcot’s Future World and World Showcase. A new “Beauty and the Beast” sing-along will show in the France pavilion in rotation with the current “Impressions de France” film. The show is being created by Don Hahn, who produced both the animated and live-action “Beauty and the Beast” films. Additionally, new films will premiere at Epcot’s Canada and China pavilions within the next year or so, though Disney hasn’t revealed many details regarding the content of each film. Disney also recently announced the new “Awesome Planet” film coming soon to The Land pavilion. The company shared that the film will be “an on-screen exploration of the realm we call home” and will showcase “the spectacular beauty, diversity and dynamic story of our earth with all the grandeur guests have come to expect.” From the sounds of it, this show will be an excellent addition to an area of Epcot known for education and sustainability. A new table-service restaurant is coming to the Japan pavilion and will open sometime in the next couple of years. Like the other restaurants and retail locations in the Japan pavilion, the restaurant will be operated by Mitsukoshi. Though we know the restaurant will draw inspiration from nature, it’s too soon to tell more details. Construction has already begun, however, and we’ll update once more information is revealed. Disney also announced that a new crêperie will be added to the expanded France Pavilion near the new Remy’s Ratatouille Adventure attraction currently being constructed. The restaurant will be both a table-service and quick-service dining location that will feature a menu inspired by the Brittany region of France and serve savory crêpes (galettes) and sweet crêpes. The crêperie will open in time for the 50th anniversary of Walt Disney World in 2021. Additionally, a space-themed restaurant is coming to Future World and will be located adjacent to Mission: SPACE. This may be the restaurant we are most excited to dine at. When it opens, guests feel as though they are dining among the stars in an experience like no other at Epcot. The restaurant name hasn’t yet been revealed, but we can’t wait to find out more details (including information about what will surely be an epic menu). One of the awesome new experiences coming to Epcot is the all-new Play Pavilion, which will open in time for Walt Disney World’s 50th anniversary in 2021. The Play Pavilion will be a complete reimagination of the Wonders of Life Pavilion, which closed in Epcot back in 2007. It will be an “innovative city” that is “bursting with interactive experiences, your favorite Disney characters, hands-on activities and engaging entertainment,” according to Disney’s announcement. Want more information about Epcot’s transformation? Later this year at Epcot, guests will be able to stop by the Experience Center at the Odyssey Events Pavilion, where guests can interact with exhibits that will showcase the theme park’s ongoing transformation projects. We’ll share more information when Disney announces an opening date later in 2019. We’re always excited when Disney announces epic new attractions and experiences coming to the theme parks, but we know that sometimes changes aren’t always what we’re expecting, and Disney is aware of that. “We’re aware, of course, that each time we touch Epcot, we are touching the setting for millions of precious family memories. So, we are very careful stewards of this park,” Disney recently shared. There’s no sure way to tell whether these changes will be as awesome as they sound, but we’re excited to find out. What do you think of the changes coming to Epcot over the next few years? Share your thoughts with us! Love it can’t wait for all the new attractions! Already new this year: Daily concerts for Art (Broadway) and Garden (Rock) festivals; Coco celebration with Mariachi Cobre. Coming this year: two new Epcot area towers: Riviera and Gran Destino; Skyliner; and the Oddessey being turned into the Experience Center with a model of the spine changes. Heavily rumored 2-3 year complete refurb of Spaceship Earth (not a retheme). Any ideas on what they will be converting the 2 Communicores to? Heard Starbucks was moving into Odyssey, and Character Spot will be relocated into Image Works (2nd floor). Club Cool will close permanently. That space-themed restaurant reminds me of Ten Forward from Star Trek: The Next Generation, but bigger. I’m in. The space-themed restaurant looks like the environment you would see in the Star Wars-themed hotel being built near DHS. The Imagineers excel at re-working themes/environments throughout the Parks.